We made this elegant Beaded Appliqué Sachet by hand-sewing crystals and pearls to a circle of organza fabric. It’s actually very easy! 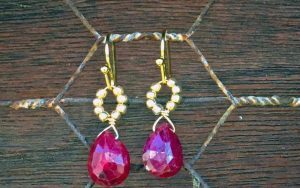 We tacked our pretty beaded flower to a sachet to make a sweet hostess gift, but you can apply beautiful beaded flowers to all kinds of things: a purse, a belt, a headband! The sky’s the limit! 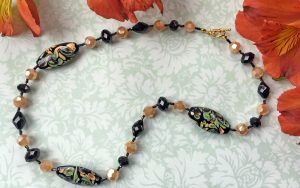 And once you start embellishing with beads, you’re sure to get hooked–just like we are! We made this elegant flower appliqué by hand-sewing crystals and pearls to a circle of organza fabric. It’s actually very easy! 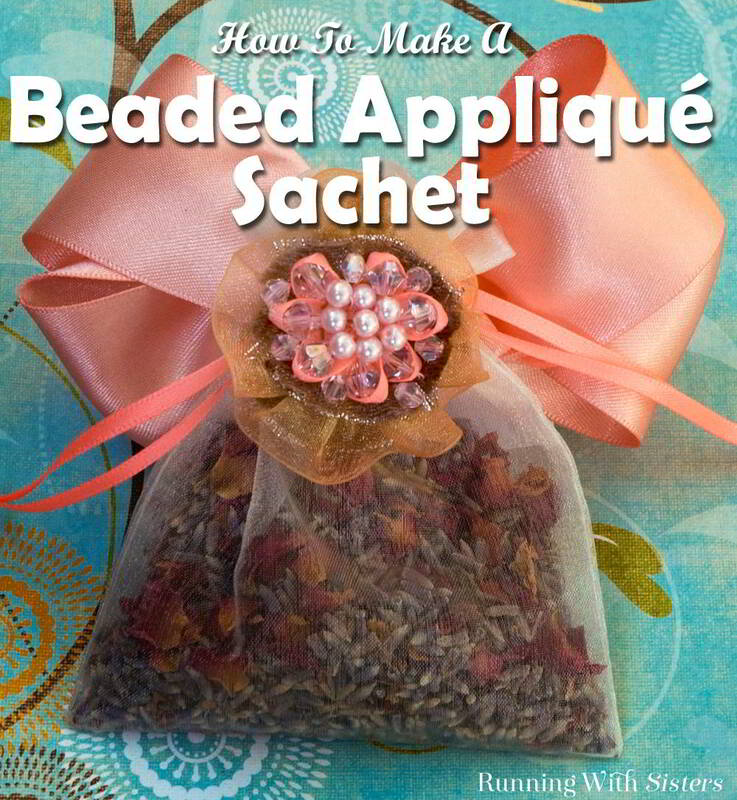 We tacked our pretty beaded flower to a sachet to make a sweet hostess gift, but you can apply beautiful beaded flowers to all kinds of things: a purse, a belt, a headband! The sky’s the limit! 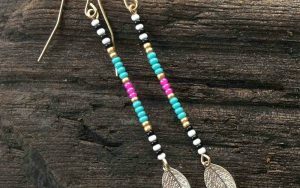 And once you start embellishing with beads, you’re sure to get hooked–just like we are! 1. Pour the dried lavender buds and rosebuds into the bowl and stir. Add 3 drops of each essential oil to the mixture. Stir, then let dry for one hour. 2. Replace the ivory ribbons in the top of the organza bag with the thin peach satin ribbon. Tie the ends in knots and trim. 3. To make the beaded flower, cut a 1¼” circle out of the bronze satin ribbon. Sew the thin peach ribbon onto the bronze circle in a flower shape. To do this, make a figure 8 out of the ribbon to form petals. Tack each petal down with the needle and thread as you go. Continue until your flower has 7 ribbon petals. 4. 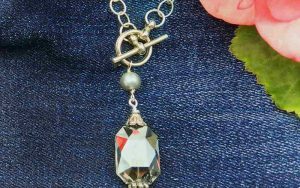 To bead the flower, sew a large bicone bead inside each petal starting with the needle behind the bronze circle. Sew a small bicone bead between the outside edges of the petals. Sew one pink pearl into the center of the flower, then sew seven pink pearls around it. 5. Cut a 9″ length of gold organza ribbon. Sew along one edge of the ribbon using a straight stitch. When you reach the end of the ribbon, pull the thread and ruffle the ribbon. Shape the ruffle into a circle and stitch it to the back of the bronze beaded circle. 6. 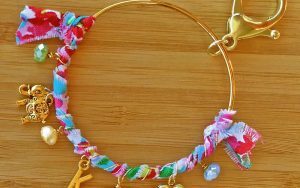 Using the same needle and thread, sew the beaded ruffled flower onto a 1¾” circle of bronze ribbon. Sew the flower to the top of the organza bag just below the ribbon ties. 7. Cut a 24″ length of the wide peach ribbon. Form a double-looped bow and tie it in the center with a 6″ length of the thin peach ribbon. Sew it to the back of the organza bag just below the ties. 8. 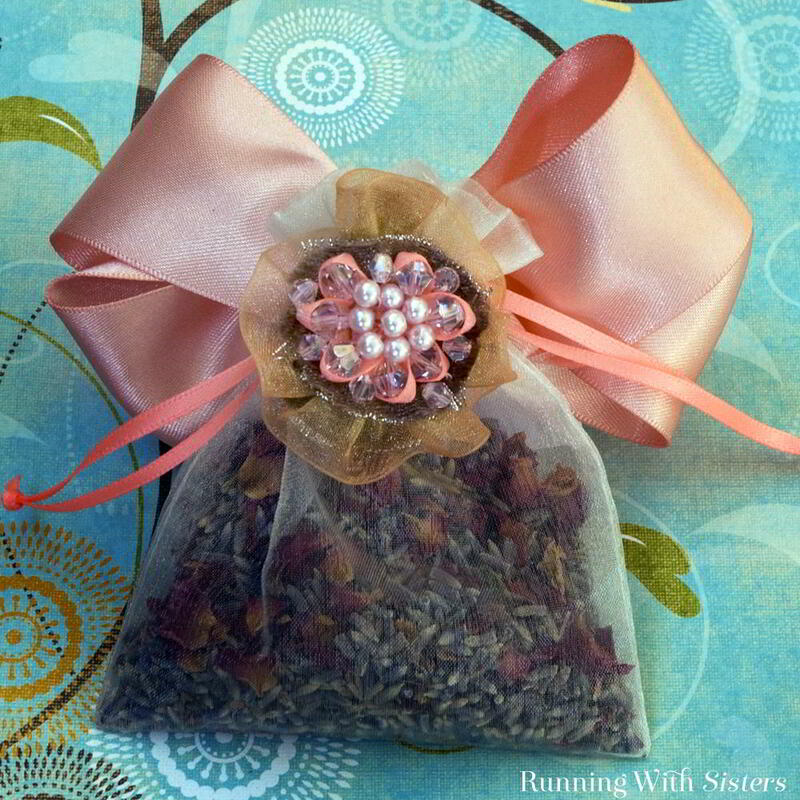 Spoon the rose and lavender scented filling into the organza bag and pull the ties tight. Fray Away: We like the look of the soft edges around our organza circles. If you don’t, you can always use Fray Check to keep your edges tidy.